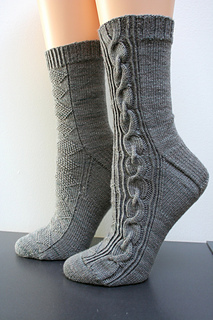 This pattern is now available for sale here on Ravelry! 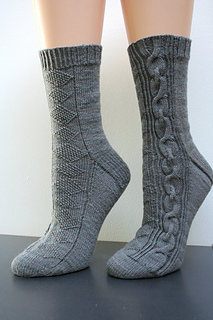 The Bailiwick socks use cable and diamond patterns, which are commonly used in Guernsey (Gansey) sweaters. A bailiwick is an area that is overseen by a bailiff -- Guernsey is one of two bailiwicks in the Channel Islands. These socks would be suitable for either a man or a woman, and knit up quickly. 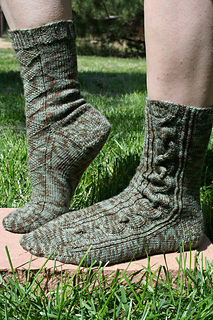 The socks are designed to be asymmetric, with the pattern down the leg mirrored from the right sock to the left. 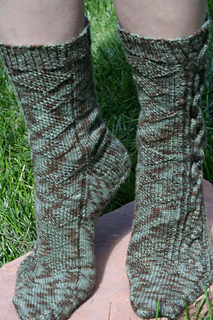 Bailiwick was originally created as the pattern for theknitter.com’s September 2008 installment of the sock of the month club.